Last week, when Singapore was hit real bad by the haze, every one went into panic, me included which is unusual coz the haze is a yearly recurring "problem" and I have sort of got used to it. This year it took a turn to the worst when 3 hourly PSI hit a record high of 400! When PSI hit over 200 I searched fanatically for masks, not the surgical masks but the N95 masks, there were no stock. So I turned to the local online marketshop Qoo10sg and was happy to be able to place order for some N95 masks, arriving some time this week. However the situation did not improve, it became worst with PSI hitting 300, thank goodness Catherine is able to give me x10 N95 masks. In the mean time I searched online again and was able find some one selling N95 masks, I bought 2 boxes, intending to distribute them amongst the siblings who were not able to get hold of the masks and perhaps some friends if needed. Then I went ahead to order some more boxes for the office, one of my boss and also helped some friends to get the masks as they were unable to get them in the pharmacies or supermarket. Well, initially when I ordered the masks online, I wanted to be prepared as DinoBoy and his cousin Megan has sensitive air ways, and Mum is not feeling that great so they are my main concerns. These masks would have been sufficient to be distributed amongst the family but the sudden turn of the situation made me scramble to get MORE masks there and then for fear of their health instead of waiting patiently for order to arrive this week. I am really not trying to create panic or start the boarding trend with all the masks buying, it really IS a timing issue. Anyway, we were really glad to have those N95 masks to use when we were going out last Friday with the PSI at 400, the air was so heavy that we were choking and couldn't breath properly, the N95 masks did help us breathe easier. 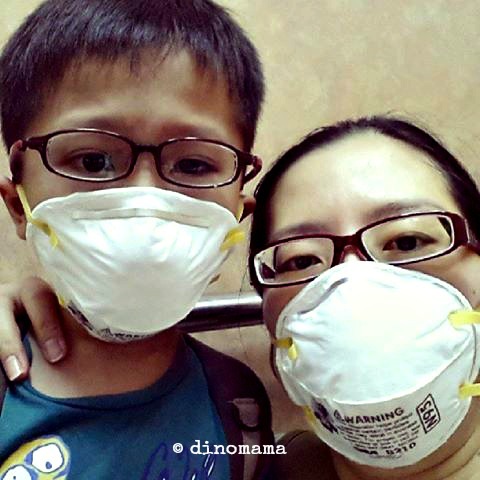 Us in our N95 mask, DinoBoy with a swollen left eye, a result of an allergy reaction to the haze. O-kay... so I have 3 boxes of N95 masks in my house and 6 more boxes (3 adults and 3 kids size) on the way to me, that means I will have 180pcs of N95 masks by the end of this week. *sigh* I'm no masks hoarder or hoarder of any kind, you may see me as being kia see (scared to die) thus stocking them up but I am truly not, I am just bad in estimating the quantity needed plus I am a worrywart, I worry that my family or friends may need them and can't get them thus I bought a few "just in case" boxes. But with the weather turning better over the weekend, now I started to feel that the masks are an eye sore to me, its time I put them in the store room before I start blaming myself for spending so much money on them. So if you need any N95 masks in future, drop me a mail and see if I have any on hand or not. 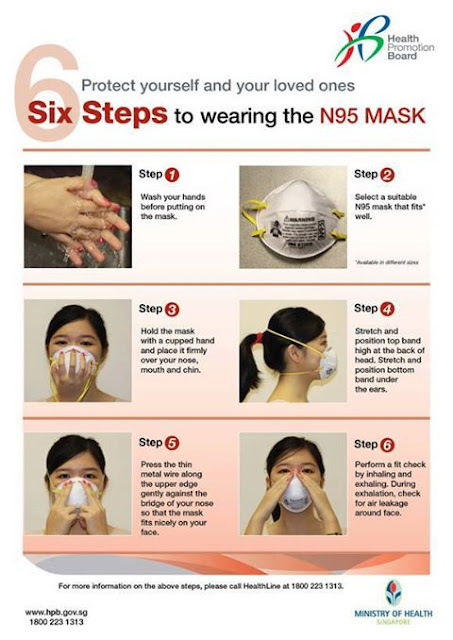 Last but not least, here is an infograph on the correct way to wear a N95 mask. Also PLEASE strap the 2 bands on instead of only the top band. The purpose of wearing a N95 mask is to cover your nose and mouth tightly to prevent yourself from breathing in any particles in the air. By strapping on only the top band the mask is still loose at the bottom thus particles can still enter into the mask which you will breath in. It's been tough for me at Sembawang too, with all that smog! Thanks for sharing!! Its especially tough when kids are involve coz we worry about them more then about ourselves or hubs. You are not alone....i have 3box and 1/2 Box of N95 and one box of surgical mask 50 Pcs Adult and one box 60pcs Kids.